1927 Archbishop Thomas Joseph Toolen, D.D., was installed as Bishop of Mobile. 1942 The Friends of Catholic Education was organized by Mr. John Carroll to help raise funds for a Central Catholic High School in Birmingham. 1946 The First Annual Toy Bowl Game was sponsored by the John Carroll Honorary Alumni to raise funds for construction of the school. Actual construction on the school building was started in November. 1947 The main educational unit of the school was opened to 278 students. Reverend Frederick Hughes was the first Principal. 1951 Construction of the Bishop Toolen Catholic Center was completed. 1953 Reverend J. Edwin Stuardi became the second Principal of John Carroll. 1957 Construction of the new school cafeteria was completed. Reverend William R. Houck was named the school's third Principal. 1958 The east wing which houses additional classrooms was completed. 1961 The athletic field located on Montclair Road was completed including the football field, baseball field, running track, and clubhouse. 1963 The second phase of the athletic complex was completed, including the erection of bleachers, lights for the football field and a concession stand. 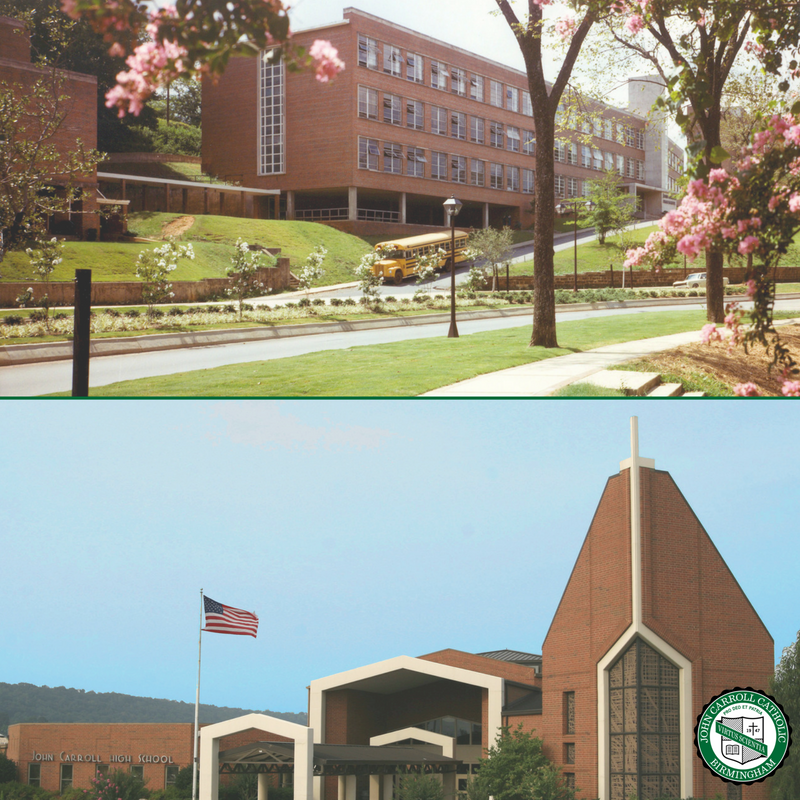 1964 The new convent for the Benedictine Sisters of John Carroll was dedicated. 1969 Reverend Desmond Regan became the fourth Principal of John Carroll. 1970 Rev. William R. Houck returned to John Carroll as Principal for one year. 1972 Mr. William J. LaPlante became the school's sixth Principal. 1975 The schedule was changed from an experimental modular system to eight periods of 48 minutes. 1976 Mr. Brice Hendrick became the sixth Principal and superintendent of Catholic Schools. 1977 Mr. Art Rainwater became the school's seventh Principal. 1981 The Activity Center (formerly the Benedictine Convent) was opened, including a faculty lounge, art room, and guidance offices. 1984 Mr. Lawrence Oleksiak became the school's eighth Principal. 1987 Dr. Rebecca Sullivan became the ninth and first female Principal of John Carroll. 1989 A Development Office was instituted with Dr. Rebecca Sullivan being named the school's first president. 1989 Mr. Lee W. Fisher was named the school's tenth Principal. 1990 The Catholic Youth Football League was formed. 1992 A new era begins with the relocation of John Carroll Catholic High School to Lakeshore Parkway. 1998 In keeping with the original intent of Archbishop Toolen, the school was officially re-named John Carroll Catholic High School. 1998 The John Carroll Catholic High School Board of Directors established the John Carroll Educational Foundation. 2006 Mr. David Chauvette was named as the school’s eleventh Principal. 2007 John Carroll celebrates its 60th Anniversary. 2009 Reverend John G. McDonald was named as the school’s twelfth Principal. 2013 Mr. Charles J. McGrath was named as the school’s thirteenth Principal. Rev. John G.McDonald was named the school’s second President. 2016 Rev. Robert J. Sullivan was named the school’s third President. 2017 Dr. Joseph F. O’Toole, Jr., was named the school’s fourteenth Principal. 2017 John Carroll celebrates its 70th Anniversary. 2018 Dr. Anthony Montalto was named the school’s fifteenth Principal.